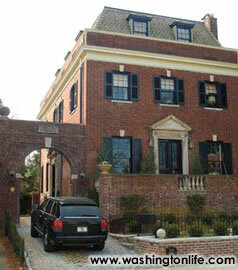 When Brook Rose and Gregg Busch purchased their historic Georgian home in Kalorama in May 2004, plaster was mercilessly peeling from the ceiling and walls, and sections of the imposing crown molding that once seamlessly surrounded the formal spaces had disappeared. Despite the unfortunate disrepair, the home at 2314 Wyoming Avenue N.W. still exuded a stately importance its condition could not belie. 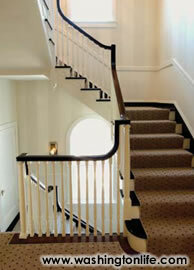 Years of neglect could not overshadow the grand architecture, proportions and period detailing. The 1916 home was first owned and occupied by Warren G. Harding during his service in the U.S. Senate prior to being inaugurated president in 1921. Of the three single family homes in Kalorama once occupied by a president, it is the only one that survives as a private residence. 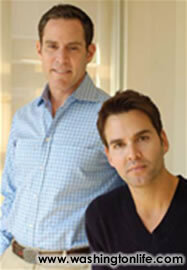 As a residential real estate developer/designer in the district, Brook had very specific ideas when undertaking the renovation with Busch, a top local mortgage banker and his partner of five years. "Priority one was to retain the original character of the home," Rose told WL. 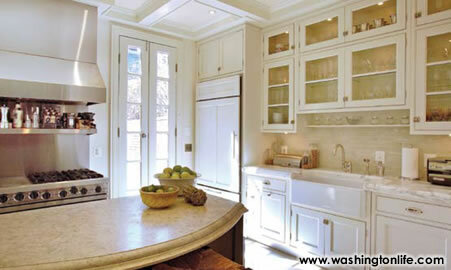 "In a historic remodeling, it is often easier and less expensive to 'replace' rather than to 'repair'. I didn't want to fall into that trap. 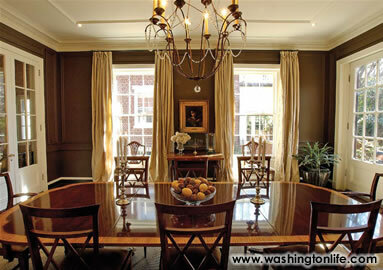 This home was a historic treasure and I was willing to go the extra mile to preserve and restore original elements." When additional doors or casings were needed for the renovation, they were perfectly replicated by a wood and door craftsman; likewise, the missing segments of plaster molding were painstakingly duplicated by a local artisan. One of the great benefits of this project, according to Rose, was that few changes had been made to the structure since its construction. This was likely due to one person living there for over 76 years–prominent Washingtonian Dorothy Tirrell Clagett, a well-known diplomatic aide at the State Department following World War II and the granddaughter of a Massachusetts congressman. Mrs. Clagett spent almost all of her 90 years living and entertaining dignitaries regularly in the home she later shared with her husband, Page Bowie Claggett. Her turn of the century Steinway piano was restored by the new owners and sits in the living room-a reminder of the accomplished pianist and singer she reportedly was. 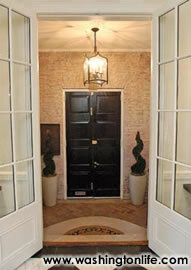 Upon entering the Rose-Busch home, the first thing to notice is the unique ante-room that leads to the foyer. It is from there that a trio of eightfoot double French doors open on to the foyer and living and dining rooms. "I always loved that architectural feature," Busch said. "We believe it was incorporated to allow for air circulation throughout the entire first floor during the hot Washington summers. Opening all these doors really creates effective cross-ventilation." To maintain the architect's original vision, the couple made a concerted effort to only change the floor plan when absolutely necessary. 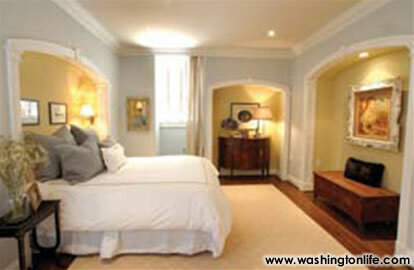 "We needed to allow for a master suite and larger bathrooms," Rose said. "Let's face it, lifestyles have changed since 1916 and we needed to update accordingly. Otherwise, we deferred to the architect's plan which was so clever in a lot of ways." One of the noteworthy elements that was saved are the extremely large landings on the second and third floors that highlight the grand staircase and produce an openness to the entire home. When designing the interior and exterior details of the house, Rose opted for "historical reference mixed with high-octane glamour. 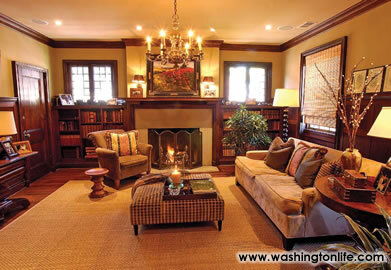 I wanted it to feel like the President's home it once was, but with a lot of style." The kitchen and all six bathrooms feature intricate floor and wall tile patterns and custom marble work designed by Rose, who worked with Urban Archaeology and Waterworks to mimic original period details. Use of color was also important to the new owners. They didn't want only neutrals and decided on a varied palette that included a cozy, yet dramatic chocolate in the dining room, a pale blue/green for the living room and subtle cream and grey wide painted stripes for the walls in the foyer and staircase. In the Georgian style, they painted the baseboard in the common areas a "blueberry black" on the suggestion of their friend and renowned designer, Anthony P. Browne. "All in all, I think we achieved the timeless quality we were after," Rose said of the finished product. "We're really enjoying it-we only wish that these walls could talk!"